"Birdscaping," or landscaping your yard with plants specifically chosen for the benefits they give to birds and other wildlife, is a wonderful way to provide essential food and resting areas for birds while beautifying your property. The most important single rule for birdscaping is to select plants that are native to your area. They will harbor the widest assortment of insects that migrating and local birds need. A good assortment will also provide food over the widest window of time. As more and more invasive exotic plants take over more and more of the landscape, crowding out native plants, less native food becomes available to the birds that need it. As an added bonus, locally-native plants are well suited to your area's normal rainfall and temperature patterns, so require the least amount of watering and winter protection. 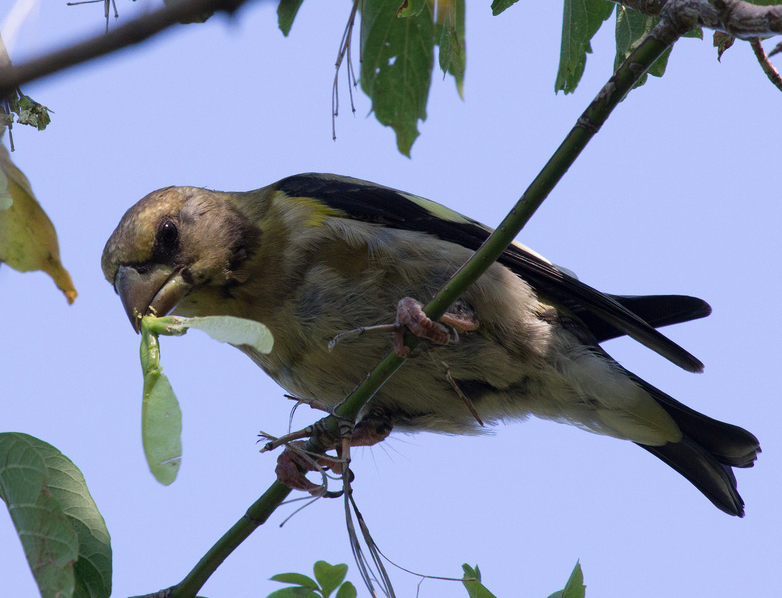 Evening Grosbeaks are particularly fond of box elder seeds. When they nest in or migrate through an area, they're most likely to notice yards that have a box elder tree, ignoring even the best bird feeding stations when they can find natural food. A good assortment of trees, including maples, oaks, and other hardwoods; spruce, pine, and other conifers, and mountain ash, cherry, serviceberry, and other fruit-bearers, will attract a good assortment of birds. Dogwood, juneberry, grape, and other shrubs and vines draw birds. The wider the variety, the more windows of time when some fruits will be available for birds. Plants that appeal to butterflies will provide nectar for hummingbirds and caterpillars for insect-eating birds. Thistle and various coneflowers and other composites provide both food and nesting materials for finches. When you visit a garden store, the key words to remember are variety and locally native.